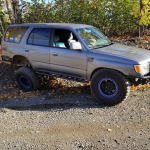 1st question, has anyone messed with 5 spd swapping an auto 3rd gen 4runner? Mines a 96 and I'd like to put a 5 spd in it if the auto ever goes. Mainly curious about keeping reverse lights, neutral safety, all that. I did one on my old 86 and it wasnt too bad. 2. When you run duals using both gear driven cases, are you able to retain the speedo? And for the crossmember, do you just use the one for 86-95 in a dual gear driven swap? 3. If I run the taco box while it's still ifs, can I put a gear driven case behind the tacobox when I swap to passenger drop front? Mainly want dual gear driven for 4.7s in the rear case. 1. There are a couple of ways to go about it. Overall pretty easy. Not as easy as the 86. 2.the speedo works from the case on non abs cars and from abs comp on abs cars. So it's easier if non abs. Thanks! Yeah my 96 has ABS so I'll have a speedo until I swap to the tons, after that I'm not sure what I'll do.